NeverSeconds: We're back and we've been busy! I've seen that you have been very busy. I bet that going to Africa was amazing! I thought I'd write to tell you what we've been doing since the time I helped with your blog. It feels like ages ago now, back when I was in Year 4. There was some really good news in the summer holidays, because my Mam was named the Anglesey Primary School Cook of the Year! On the first day back in school, my headmaster gave her a gold medal just like people in the Olympics! I thought it was real gold at first but when I held it I realised it was plastic! 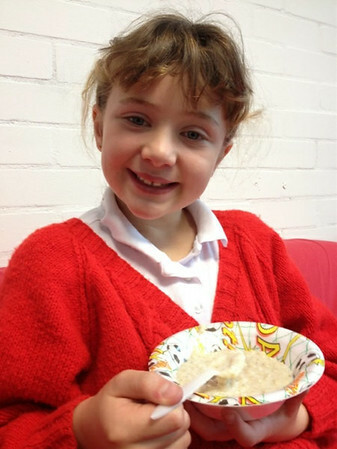 Last week we sold porridge at break time to raise money for Mary's Meals. I liked the porridge. I have sent you a picture of me eating it. There was syrup on the spoons to make it sweet. I think the School Council are going to ask if we can have porridge in our Breakfast Club because everybody liked it. I have sent you a picture of my dinner. We had Parisienne Chicken Pasta. I know pasta is from Italy, but we get more choice this way. I like pasta. It came with veg and salad and Parmentier Potatoes (cheesy roasted cubes!). I had some garlic bread too. For pudding we had Apple Tart with Creme Anglaise (I think that is French for custard!). There was fresh fruit too, but I wanted the tart. It was lovely! We've kept the best news until last. All the children paid so that they didn't have to wear school uniform, and our School Council members decided that the money will go to Mary's Meals. Mr Roberts is going to pay it straight into your justgiving account. I don't know exactly how much it will be, but usually we raise over a hundred pounds! Thank you all for your hard work raising £150. 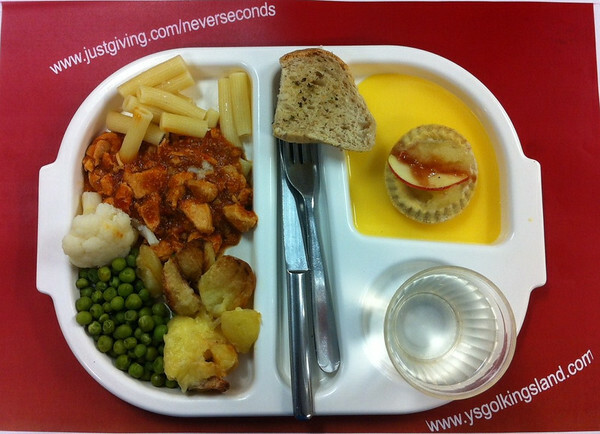 It's brilliant and will feed 2500 children a school dinner! Blod and all at Ysgolkingsland, great post, great porridge - especially with syrup and an awesome amount on money so kindly donated to Mary's Meals through Martha's justgiving page. Brought a tear to my eye (both actually). Have a really great half term break, and maybe we will be able to read further posts from children of Ysgolkingsland in the near future. P.S. Congratulations Blod's Mum on your award - Anglesey Primary School Cook of the Year! How wonderful! Educational, fun, memorable AND Charitable! Good all around (the world). Cute! That looks like a delicious meal. Well done to you and all of the other kids. And I just wanted to say how nice it was for all of your guest bloggers to pitch in. It was a wonderful world tour. Brilliant. Well done Blod. You seem to have some great fun and great food with your school lunches. I'd like that for my lunch!